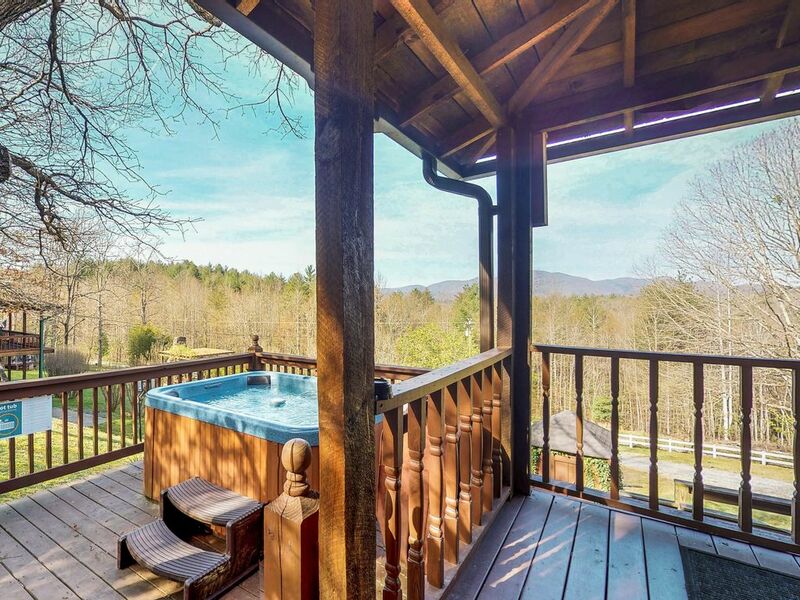 If you're heading to Blue Ridge for a rejuvenating break from the day to day, come settle in at this quintessential cabin in the woods and revel in your own private hot tub, an outdoor firepit, lovely mountain views, and more. And you'll be happy to know that you can bring along two dogs, as well, for a small nightly fee! You'll be located near the Aska Adventure Area, so head out for a hike or fish for trout whenever you like, or kick back in one of the Adirondack chairs around the firepit while you imbibe a glass of wine or roast marshmallows. The gas log fireplace will keep you toasty on chilly evenings while you entertain yourselves with the free WiFi, cable TV, DVD player, and foosball table. And when the temperatures rise, the AC will keep you cool. Cook in the full kitchen or on the gas grill, and wind down at the end of the day in the hot tub or on the deck. You'll also have a washer/dryer for your added convenience. Come reconnect with your family and friends in the beautiful North Georgia Mountains. Book this beauty today! Parking Notes: You enjoy paved access. It's the perfect place to get away, curl up with a book by the fire or soak your cares away in the hot tub. Would definitely return. The cabin was nice, we enjoyed our stay and would consider staying again. We enjoyed our time in the cabin. It had all the amenities we needed and we would stay again. My boyfriend and I loved the cabin. Could not have been more impressed. Great views and loved the hot tub! We had a nice relaxing stay in this home. Would definitely come again. Cozy and comfortable. We loved the view the quiet and fresh air beautiful little cabin. O and the Jacuzzi was awesome .